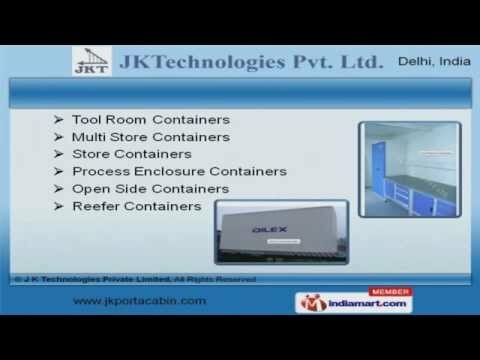 Welcome to J K Technologies Private Limited, Manufacturer and Exporter ofÂ PortaÂ Cabins. The company was incorporated in the year 2000. Saudi Arabia and Africa are some of our major markets. Good transportation facility, customized packaging and industry leading prices are the plus points of our organization. We offer a wide assortment of Shipping, Ply Lined and Blast Retardant Containers. Tool Room, Process Enclosure and Reefer Containers offered by us are best in the industry amongst others. We also provide Laboratory, Industrial Shipping and Equipment Enclosure Containers that are cost effective. We have gained tremendous expertise in providing Portable Offices, Flat Racks and Specialist Container Linings. We are specialized in offering Toilet Blocks, Prefabricated Structures and Container Conversion Services that are widely appreciated in the market. Our Aluminum Lined Containers for Food Grade Materials and MilkÂ StoragesÂ are widely demanded in the market.